that they can trust me to tell them the truth about having a baby. pregnancy was a 100 times worse than the labor or birth. i'd been having he should at least give me a break while having her. i was scheduled to be induced on the 12th. my due date was the 10th and my doctor didn't want me to go any later than that. brette another week to come on her own. that is why i was riding harley's, mowing the yard and ronnie and i even went mudding in the jeep. but in the end, none of it worked and i had to be induced. we checked in on tuesday night at 8:00.
ronnie, his mom and i had just had a big dinner at olive garden. i knew it would be the last thing i could eat until she came. we walked in the hospital with another couple also scheduled to be induced that night. she and i are were so scared. i can only describe it as crazy fear. fear of not knowing what's going to happen. i felt better once i got in the room. here's a picture of me from that night. and be induced at 9:00am the next morning. basically the cervidil softens your cervix and gets you ready for labor. they give you a forth of a pill every four hours. it shouldn't put you into labor but just give you some mild cramping. the first dose, i was fine. a little uncomfortable but nothing crazy. the second dose, i was pretty uncomfortable. it reminded me of a night at had at home when i thought i was going into labor. but the third dose, it was five in the morning, i was in definite pain. i called the nurse into my room at seven because i was nervous. i told her that if this wasn't labor i was really scared because the pain i was in was pretty bad and i didn't know how i was going to make it through something so much worse than this. i think she thought i was a wimp. she told me that birth was painful and that we could try a heating pad. but she said she couldn't tell because of the way i was laying. she said that if my pain was really that bad then i could have a pain killer in my IV. i said yes to that. but it made me so tired. i felt like i could sleep for five years. even though the medicine wasn't supposed to do that. and i didn't have to have any potosin - which i was afraid of. i heard it makes things pretty intense and painful. i was in true pain and not just having mild cramping. about 15 minutes later (around 9:00am) my doctor showed up to check on me. i was dilated to a two and she decided to break my water. after that the contractions got more intense and so my nurse ordered my epidural. within the hour the anesthesiologist was there. 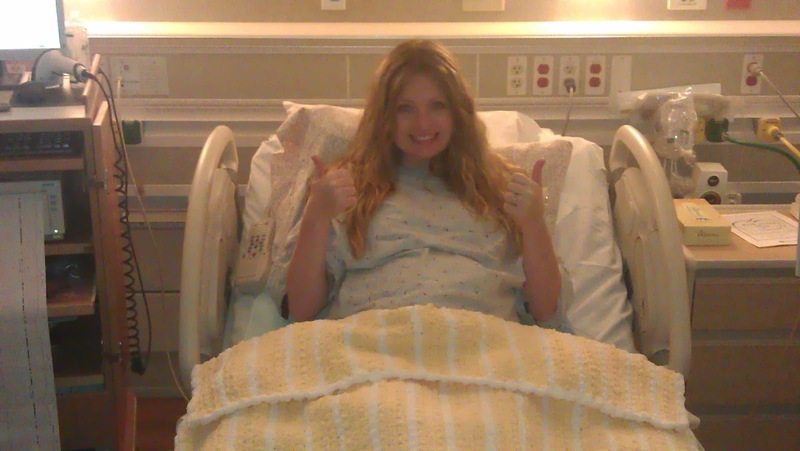 i wasn't afraid of the epidural and honestly it wasn't that bad. it feels exactly what you would think it would feel like. a shot in your spine. after that, i felt nothing. my nurse checked me at 11:30 and i was at a four. at that time she told me she was going to give me a tiny bit of potosin. and she thought this would help speed up the process. i could feel pressure and i felt like i wanted to push. i think i surprised everyone when she checked me again and was at a nine. five centimeters in an hour and a half! she had me labor for another 30 minutes. i felt like i was going against nature. just waiting for the green light. come to find out my doctor was in surgery and we were waiting on another doctor to come deliver. finally, my nurse went ahead and got me ready. i did two to three pushes and she called for a doctor immediately. apparently brette was ready to make her entrance. a random doctor showed up in the 11th hour. i did three or four more pushes and baby brette was here. a perfect little baby was born. when people say "it isn't that bad"